The original building of the United Methodist Church is shown on left. The United Methodist Church of Linden is the oldest Church in the City of Linden, having been incorporated on September 25,1866. The incorporation papers are on file in the Union County Clerk’s Office in Elizabeth, New Jersey. 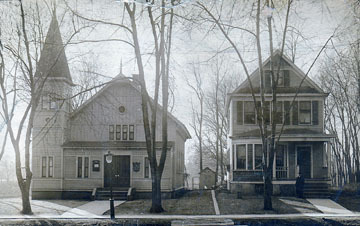 The first building (pictured at left) was an old school house in Linden, located on North Stiles Street, near the corner of what is now Knopf Street. It was purchased for $1,250 and met at that location for several years. In 1881, the old school house was moved to the present location on property donated by the Blancke family. As Linden grew, so did the Church. In 1907 an extension was added to the Church and a new parsonage was built next door. In 1911 a gym was added. At this time, the Linden High School rented the gym for the use of the students – the boys for one night and one afternoon each week for $10.00 per month and the girls for one afternoon a week at $3.00 monthly. The first Boy Scout Troop in Linden (Troop #1) was sponsored by our Church and met in the gym every week. Sunday School classes were also held there in addition to other rooms throughout the rest of the buildings and the sanctuary. In 1916 a kitchen was added to the Church and the building was wired for electricity, but the parsonage did not have electricity until nine years later. In 1921 the balance of the property next to the parsonage was purchased at a cost of $2,600. By 1925, the congregation had outgrown the facilities, so the Church was torn down and the present Church was built. A basement was also built under the gym. The membership in 1925 was 161 adults and 412 children. In the years that followed, many organizations of the Church were active: Junior and Senior choirs, Couples Clubs, Bible Study groups, Boy Scouts and Girl Scouts, Workshops, Sunday School classes, Junior & Senior Youth groups, nursery classes during worship, picnics and bus trips. The Church continued to grow and prosper. In 1962, a new addition housing a large social hall, new kitchen, bathrooms, pastor’s office and Sunday School rooms was added at a cost not to exceed $100,000. At this point we had a Church membership of 490 adults and 295 children. In 1973 a new parsonage was purchased and the old one was rented for a number of years. It was eventually torn down and a Memorial Garden was established in it's place. Today, in the Spring, our city business district glows with the beautiful flowering trees and bushes in our garden. The Church has continued to be an active part of the Linden community. Some of the activities of our Church have been: 30 years of Kiwanis luncheons, Junior Chamber of Commerce luncheons, Bountiful Baskets to help feed the needy, Rummage sales, Christmas fairs, Smorgasbords, Wednesday Workshop, Weight Watchers, Candy Mountain Day Care, Polish Fencing School, community meetings, Parents Anonymous, Alcoholics Anonymous, Dianne Long Scholarship, Gregg Carhart Scholarship and William Steiniger Scholarship, Clown Ladies, Monthly Messenger, Bake Sales, Linden Seniors Shuffleboard, newspaper delivery meetings, voting machines for the Ward, rentals for Weddings, Showers and Celebrations, catering dinners for Boy Scouts and Girl Scouts, service clubs – and many other activities too numerous to remember! The present membership has a very important part in our Church. As we remember the past, we also look forward to the future, when others will continue the history of the United Methodist Church here in the City of Linden. We will always continue to serve God, our Church family and our community.